One thing I love about blogging is finding new products, new brands, new favourites and you know what, it is even fun finding the not so favourites but then rediscovering them and wondering why you didn't love them the first time around. a clinical skincare brand, powered by safe, proven ingredients and smart botanicals - for your healthiest skin... ever. Created by an aesthetician, formulated by a plastic surgeon, and represented by a network of 20,000 skincare professionals in over 52 countries worldwide. Understanding your skin is, in my opinion, important. There is absolutely no point spending hundreds of your hard earned cash on something that isn't going to do anything for you and part of this is learning. So, ive been using three products from the Image skincare range. 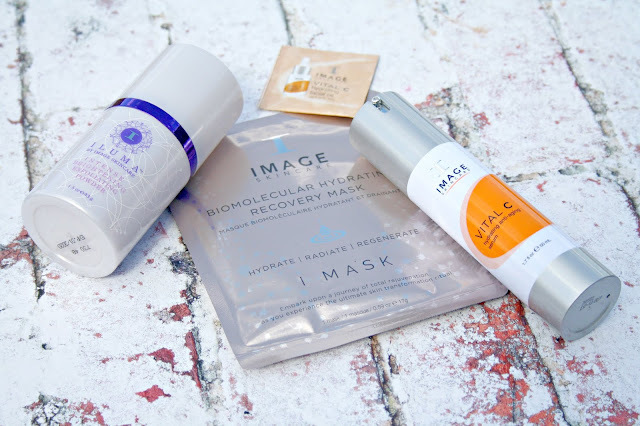 The first product was the i-mask biomolecular hydrating recovery mask which is a really thin hydrogel mask which feels absolutely incredible on the skin, almost like a second skin. Harnessing the very latest in Korean skincare technologies this moisture-rich, the mask contains what is referred to as an advanced concentration of ultra-hydrating ingredients such as Jeju Volcanic Oxygen Water and Onsen Sui Mineral Charges Water, ginseng root extract, amino acids and antioxidants which work to rescue dull, dry skin. having just had one of the hottest few weeks I can remember, working a lot of overtime at work, coming home to try this mask, of which I purchased a few more, has been just heaven. Cooling on the skin, there isn't much of a scent to the mask, but after laying down with the mask on your skin for around half an hour, once removed, my skin was so soft, smooth and plump. One of the most hydrating masks I have used for some time. 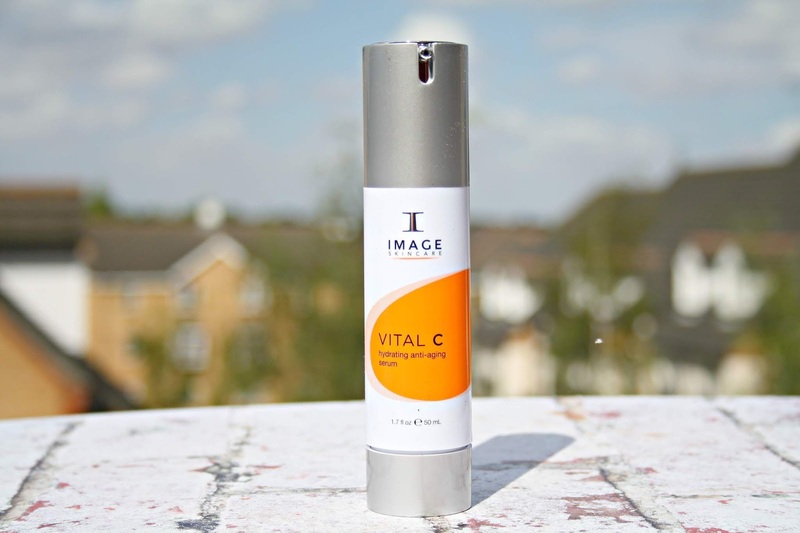 The second product is the Vital C Hydrating Anti-Aging Serum. Described as being a multi-action, anti-aging facial serum using the new technology of oil-soluble Vitamin C.
Formulated with Vitamins A, E, as well as highly potent anti-oxidants hyaluronic acid and green tea and meadowsweet which are both anti-inflammatories, this hydrating serum rejuvenates dull, dry, tired skin and minimizes and smooths visible effects of stress and fatigue. With a pump action bottle, one pump is enough for the entire face and neck and it is not greasy or tacky but it does smell just absolutely incredible of citrus which is a delight to use. The serum, which is more like a cream, disappears into the skin on contact and it is perfect for using after cleansing in a morning. The final item from the Image Skincare collection ive been using is the Iluma Intense brightening exfoliating powder which I was really curious about. Described as being a unique but luxurious exfoliating powder which gently cleanses the skin. I had expected this powder to be quite abrasive, but it is infact quite finely milled, but it still does an incredible job to remove debris and oil from the surface of the skin. 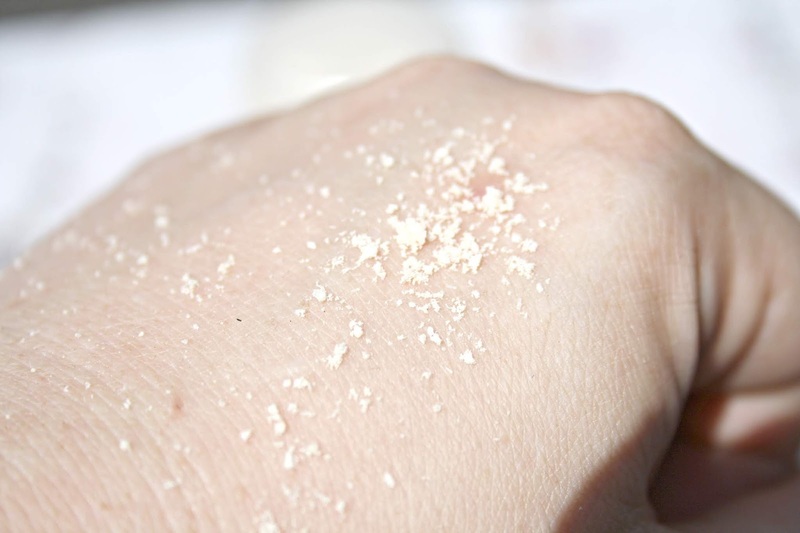 Shaking a small amount onto wet palms, it is activated as soon as the hands are rubbed together to create a light foam. At this point, you massage the foam onto the skin, whilst avoiding the eye area. I also mix it in with my cleanser when I feel my skin needs a little more TLC. Using ingredients such as Coconut Milk Powder which is rich in protein and vitamins, Pumpkin Enzyme which provides gentle exfoliation and is great for buffing away dead skin cells and impurities while at the same time delivering vitamins and nutrients to the skin, licorice extract, which is a natural skin lightener and Green Tea Left Extract which has both antioxidant and anti-inflammatory properties. Without question, the Iluma Exfoliating Powder is my favourite of the three products and I love how silky smooth my skin is after use and just how good a job it does at removing all kinds of nasties from my skin. So there is something for everyone within each one of these ranges and I love that you can search for a product via your skincare concern. This brand sounds quite good. 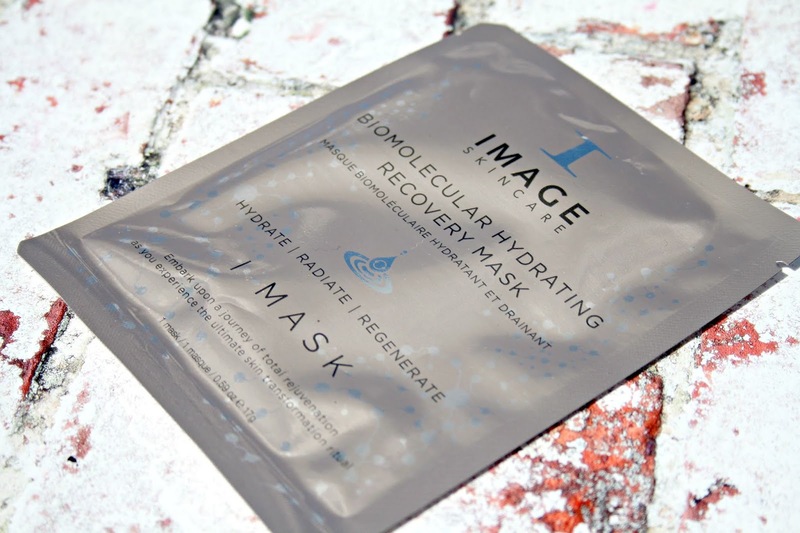 I like the sound of the hydrating recovery mask - I need a weekly one! I tried the exfoliating powder last year and loved it! I really need to explore this brand more. From the name of the brand sounds like a premium products and its packaging are really nice. Thanks for sharing this. Ooooo they look so good! I really want to try the Iluma Exfoliating Powder now! I need to try so much more from them, everything sounds amazing!